Perhaps one of the most luxurious places to stay in Sri Lanka, Amangalla is an oasis of colonial refinement in charming Galle Fort. Unlike most of the Aman group’s properties which have a resort-like feel, Amangalla is decidedly a town hotel, where the visitor can experience the architectural splendor of yesteryear first hand. 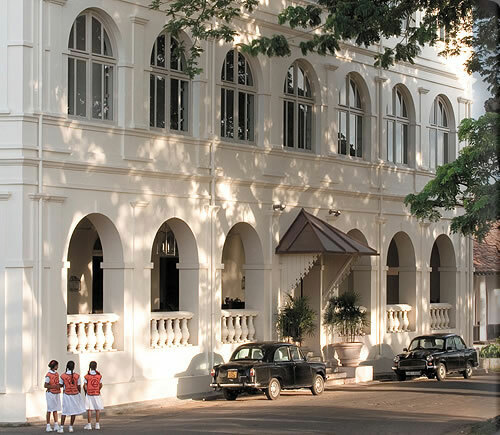 Previously the New Oriental Hotel, the building has always been of historical significance to the town of Galle, founded in 1885 by the Sarkie Brothers, the Malay (of Armenian origin) hoteliers who built the famous Raffles Hotel in Singapore. Amangalla has respected, down to the finest detail, the heritage and natural appeal of its legendary predecessor by skilfully unveiling and restoring original features, furnishing the polished jack-wood floors with fine antiques and period-styled reproductions, the culmination of which reflects an ambiance of a bygone era. It is surrounded by antiques, old prints, polished aged-floors, crisp white linen, pristine walls, rich mahogany, wood and rattan planters together with a gracious, welcoming and warm staff. A leisurely walk leads past the old Dutch Church, the Governor’s house, the spice warehouses, Court Square, the Kacheri (town hall), the lighthouse and on to the sea wall and ramparts. Visit the mosque and meander down streets leading to cricket fields, the temple, and the old District Judge’s house surrounded by ancient frangipani treess. After a morning’s exploration, you’ll be glad you’re staying at Amangalla because of the extra things this hotel offers which makes it special- the delicious food, the lovely pool area (with very cushy rest pavillions), the library (for those wanting to brush up on the Fort’s history, or maybe just check email), and the fabulous spa, which they call “The Baths” (try their 3 or 7 day Ayurvedic package- sheer bliss! ), and of course the immensly comfortable rooms and suites. Those seeking a little extra privacy can also stay in the Garden House, a two-story detached house, brimming with charm, with its own dedicated butler to cater to your every whim. It’s worth also shouting out a special mention to Olivia Richli– the manager of Amangalla. She is a long-term Galle Fort resident and knows the area like the back of her hand. So she is a huge help to anyone who stays and really gives an excellent all round service. She was also fantastic in the Tsunami- opening up the hotel as a hospital for victims. And one more good thing about this Aman hotel is its prices, being relatively lower than other Aman properties. Rooms start at just $275.